No matter what stage of homeschooling you’re in, from just beginning your feasibility study, to graduating your student, the Home Educators Association of Virginia’s Homeschool Convention is one you won’t want to miss. There are many compelling reasons to attend a homeschool convention, especially one as comprehensive as HEAV’s. 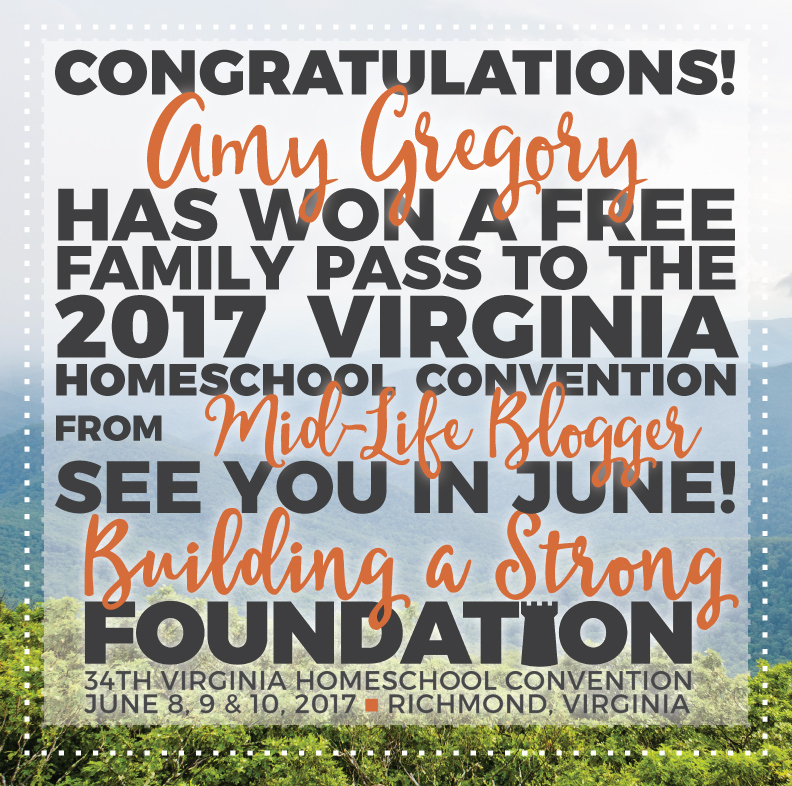 There’s even a giveaway for a free Family Registration to the 2017 HEAV Homeschool Convention! Scroll down to the end to enter. HEAV’s 2017 theme is “Building a Strong Foundation,” and there’s no better place to begin your homeschooling journey, or do some shoring up. If you are in the beginning stage of learning about homeschooling, a convention is a great place to gain experience through full immersion. Through observation, you can see for yourself that homeschooling families are all unique, but not “weird” as you’ve been led to believe. You’ll see socialization in action, and how homeschooling affects family ties. While watching the graduation ceremony, you’ll see that homeschooling through high school is possible, and share in the joy with proud parents. By attending workshops you can begin to learn about different homeschooling approaches and student learning styles. Your eyes will be opened to the freedom and blessings that await those who choose this lifestyle. HEAV offers three “Homeschool Success” workshops on Thursday, June 8th, that are free and open to the public. Once you’ve made the decision to start homeschooling, the next question is “How?” The HEAV convention will have over 350 vendors with everything homeschooling. You’ll be able to look at the products and ask questions of the vendors, many of them homeschooling parents themselves. You’ll also have the opportunity to compare your favorite curriculums in person. You can see the whole list of vendors here. Tip: With so many products to consider, you might find it helpful to do a little research on them ahead of time and note the ones you want to make a point to see. You can actually save money by attending homeschool conventions. When buying curriculum in person you’ll save money on shipping, and vendors often offer discounts at conventions. HEAV also has a used curriculum sale where you can buy books and materials, as well as sell the things you no longer need. One lucky winner will save even more money by receiving a free Family Registration. Be sure to enter the giveaway below! Support is extremely important for homeschooling families and conventions are a great place to make these connections. Join Home Educators Association of Virginia – HEAV is a non-profit organization for the state of Virginia. You can read about all the great services they provide by visiting their “About” page. Home School Legal Defense Association – HSLDA is a national organization that provides many services to homeschooling families. Their members can rest assured that if they have a problem with child protective services, the local school board, or government, that they can call HSLDA for advice or legal assistance. They also serve as watchdogs, scrutinizing proposed legislation for any threats to homeschooling freedom. Consider joining HSLDA not only for the protection of your family, but also for others who may need their services and for the future of homeschooling. By attending workshops you can build your confidence in teaching your children. This year’s workshops span all subjects, as well as specialized areas such as special needs, adoption, and learning disabilities. One homeschool mom said that she “didn’t feel so alone and intimidated,” because of attending a convention. J. Michael Smith, of Home School Legal Defense Association (HSLDA), is one of this year’s keynote speakers. I recently had the opportunity to interview him and you can read what he had to say in “Homeschool Heroes.” Click here for the list of speakers and their workshops. Tip: Plan ahead and make note of the sessions that you don’t want to miss. The convention also offers a Leaders’ Luncheon and a Single Parents’ Luncheon. These events require pre-registration, so follow their links to learn more. I’ve never seen so many activities offered. Even if the convention required traveling it would make a fun trip for the whole family, not to mention that it’s in a historic area. Here are some of the special events, but be sure to visit their website because there are more than I can list! Activities for children and teens such as art, photography, chess, a math tournament, a music competition, a dissection lab, and more. A College and Career Fair – follow this link to see all of the colleges, tech schools, military branches, and companies that will attend. There’s even something for pastors. Admission is priced by the family. Pay one low price for a Family Registration, and your spouse and dependent children attend FREE! There are opportunities for free admission for qualifying families and grandparents. To see if you qualify for free admission or to apply for a scholarship, click here. All the information you need to make hotel reservations and find your way there, can be found on the convention website. There’s even a shuttle service. They’ve thought of everything! Homeschool conventions can be overwhelming, especially one as large as HEAV’s. If you’re new to homeschooling, I’ve written an ebook called “9 Easy Steps to Homeschooling,” that takes you through some exercises that are beneficial in the beginning. It may be helpful to work through before attending the convention. There are many good reasons to attend a homeschool convention and with HEAV’s being the second-largest in the nation, it’s even more worthwhile. It’s important for your homeschool to have a strong foundation and you can build it by choosing great curriculum, strengthening your confidence, and connecting with other homeschoolers – all at the HEAV Homeschool Convention! If you’re ready to make your arrangements, please visit HEAV’s registration page. Enter here for a chance to win a Family Registration to the HEAV Homeschool Convention, valued at $79. One lucky winner will be chosen at random and notified by email.